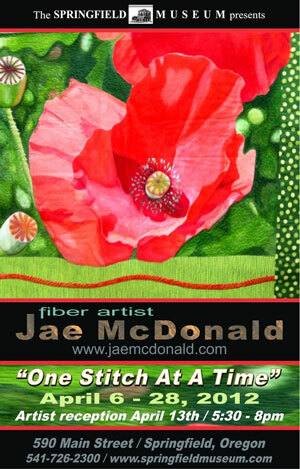 If you are in Oregon this month, don’t miss this opportunity to check out fiber artist Jae McDonald’s collection “One Stitch at a Time” at the Springfield Museum. The artwork will be on display from April 6th- April 28th. McDonald has a variety of fiber interests from art quilting, needlework, weaving, basketry and many more. With a great deal of experience and show history, McDonald’s exhibit will include wonderful pieces that may even inspire you to get out your needles or hooks and start on your own new projects!